Shopping for and eating locally grown ingredients is something that we try to do as much as possible. Being in the middle of the city it can be a bit tough at times, but luckily for us there is a great CSA in Philly. We got even luckier when we found out there is a small farm stand setup at the nearby park every Saturday 5 blocks from our house. There is nothing better than waking up on a sunny Saturday morning, brewing some coffee and walking to the farm stand. We are always eager to see what they have in stock. A lot of times it will be an ingredient we have never used before. The farmers that run the stand are always generous with their knowledge of the ingredients and even share recipes and preparation methods for a lot of them. This week the stand had black cherry tomatoes that were perfectly ripe. They looked beautiful and tasted sweeter and fruitier than a normal cherry tomato. We knew we had to get a basket full and use them throughout the week. These tomatoes are truly the star of this Low Carb Caprese Chicken. You will see Caprese Chicken without breading a lot of the time, and that’s great too. 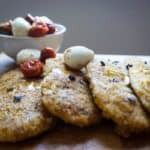 However we’ve been perfecting our breaded chicken recipe over the past few weeks, and when we found the tomatoes at the farm stand this recipe came together and we knew the chicken breading would be a perfect fit. Chicken without breading cannot easily be substituted into this recipe since most of the seasoning and flavor is contained in the breading. We’ve tried just about every type of low carb breading in the book and this one if our favorite. It is really the only one that get’s crispy, but not rock hard, just like italian breadcrumbs. For the breading we use pork rinds and parmesan cheese, along with some herbs. It’s super simple, just blend it all in a food processor until you’re left with a powdery consistency and you’re good to go. We’re using chicken breast in this recipe, but you could also opt for boneless/skinless thighs. Pound out the chicken slightly, we want about a half inch thickness. That thickness allows for us to get a light crisp on the outside without overcooking or under cooking the middle. All that’s left to do with the chicken is to fry it up. The pork rinds have a good amount of fat in them so there isn’t a need to fill the pan up with oil. Simply spray a bit of olive oil or coconut oil and place the chicken in on medium-high heat. It will take 8-10 minutes per side. A classic Caprese Salad contains tomatoes, mozzarella cheese, and basil, and is one of my go to keto appetizers. It pairs perfectly with the chicken since we are infusing the breadcrumbs with all kinds of italian flavors. To prepare the salad, heat a pan on high with a teaspoon of ghee. Once the pan is up to temperature throw in the cherry tomatoes. They are only going to take about 2 minutes to cook. We want the skin to blister, but we don’t want them to cook down too much. Add some rosemary and salt to season and set the tomatoes aside to cool. As the tomatoes cool we will add in the mozzarella and toss together. I opt to serve the warm Caprese Salad in a small dish alongside the fried chicken. Top the chicken with some fresh chopped basil. Olive oil should be applied liberally to both the chicken and the salad. Enjoy! Pound chicken breast to a thickness of 1/2 inch. Prepare the breading. Combine pork rinds, parmesan, oregano, pepper, and garlic powder in a food processor and pulse until a uniform powder is formed. Prepare the egg wash. Crack an egg in a bowl and beat until white/yolk are combined. Bread the chicken: Pat the chicken dry with a paper towel. Dip each piece into the egg wash, followed by the breading mixture. Place on a plate and allow to rest for 5 minutes prior to frying. Heat a nonstick pan over medium-high heat. Spray with olive oil or coconut oil and add the chicken. Cook 8-10 minutes on each side. Heat a pan over high heat with 1 tsp of ghee. When the pan is up to temperature add the cherry tomatoes as well as the rosemary. Cook for 2-3 minutes. We want the tomatoes to begin to blister, but not fully cook down. Allow the tomatoes to cool until they are warm to the touch. Toss in the mozzarella and serve beside/atop the chicken. Drizzle the Caprese Chicken with olive oil.